Hi ! I thought I'd share my red slipcovers for my "new" kitchen chairs. I bought the red and white checked and red and white striped fabric from Ikea. Did some red and white striped piping. We are pretty much slobs here, so I knew the white covers wouldn't stay white. These covers are washable and than if I want, I can take them off to reveal the white seat. Now I won't worry if someone spills or drops something. I'm getting my ,mantle decorated for Valentines and will take pic's as soon as the sun comes out-don't know when that will be-it's so dreary outside. Thanks for all the great comments on the Valentines pillows. You should try one. They are fun to make. Have a great day! And no, I am not - as my word verification suggested - psycho! Too funny! So adorable. I bought a "new" chair at an estate sale that needs recovering in the seat. I've got the old one off, now I need to find some fabric and get it finished. Thanks for the inspirations. Oh Leslie...these are sooo perfect!! You are a true artist and a great seamstress also!! Someday I hope to sit in those chairs in that darling kitchen...and we will talk and laugh and just have fun!! What a cheerful, inviting kitchen table. Wonderful job on the chair covers. I knew you were a kindred spirit, we're slobs over here too bwahhahhahaha! Your chair seat covers are so darling, you did a beautiful job. You are so industrious! Could you wave a little of that over my way teehee?! My dad's girlfriend unearthed my mom's sewing machine and they brought it to me yesterday evening when we all met for dinner. It's a Singer Featherweight - the one I learned to sew on. Brings back tons of memories. Happy Tuesday and happy crafting to you! I agree with Cindy, your chair covers ARE perfect. What a fabulous job you did on them. Your Valentine's Day pillow are precious as well. What a beautiful job! Hearing your comment about white not staying white reminds me of my sister. She used to have these gorgeous white couches that were all pillow, no couch if you know what I mean. I told her when she had kids (or even got married) she'd be getting rid of them. Or at least recovering them. And yep, she has a nice shade of brown now. Hides the dirt, ha! Those are wonderful!!! You did such an amazing job on those....love them!! 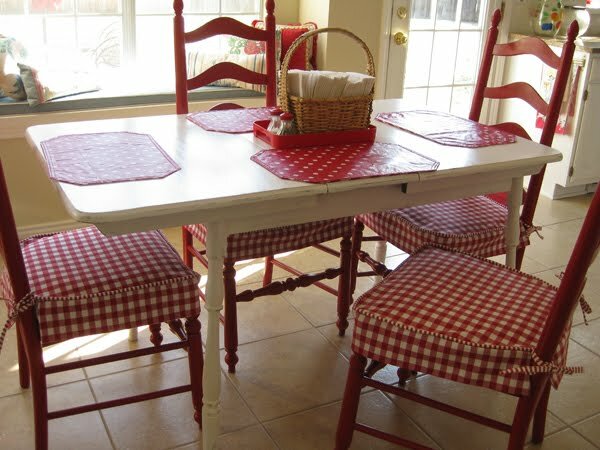 Love the red and white, it's so cheery!!! You did such a professional looking job on those chair covers Leslie! I especially love the striped piping with the checked fabric. I wish you lived nearby, so maybe you could show me how to cover the cushions on my living room chairs. I did one so far, and it's kinda awful! Oh, I've got to learn to sew again! These are the cutest seat covers! I just love your cherry display! So yummy - and Valentine-y! We love your chair covers! They are so bright and cheery! We also love the striped piping that you picked out they add the perfect touch! Hi! 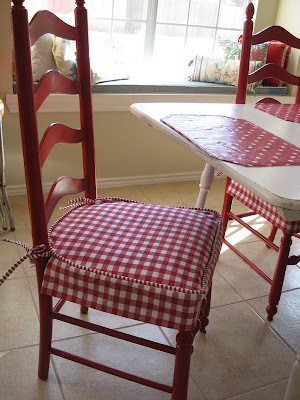 I was googling ideas for kitchen chair covers and I really like yours. I have sewn some, but I am need directions to make this. Would you be able to tell me how you did it? My email is kandnstark@gmail.com Thanks! don?t forget this website and give it a look on a constant basis. It's perfect time to make a few plans for the long run and it is time to be happy. I have learn this publish and if I may I want to suggest you few fascinating issues or suggestions. Maybe you could write subsequent articles regarding this article. I desire to read even more issues about it! pay a quick visit this web site, Keep up the pleasant job. you're in point of fact a good webmaster. The web site loading speed is amazing. It sort of feels that you're doing any unique trick. In addition, The contents are masterpiece. you've performed a wonderful process on this subject!